Obtaining the complete set of police reports from MPD on police calls to DCPS locations is no small feat, and for that, I salute Sarah Larimer and Andrew Beaujon and his team at TBD for ferreting the information out through a long process of FOIA requests. This past summer, they received a massive PDF which they processed into individual reports and have mined into a database for everyone to use. 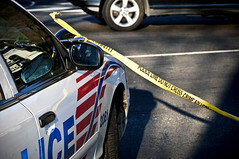 The individual reports are linkable, and contain information that other organizations could use to spark research, or just to gather demographic data on the crimes that are happening in DC Public Schools, and how the MPD is responding. There’s a problem here, though, and it seems to be endemic among the Allbritton Company products: as great as the original ideas are, the execution of those ideas is half-assed. The full listing of crimes is available on their website, but you can’t search it, filter it, or move through it quickly. A giant mass of information is a phenomenal thing, but it’s only useful to the community at large if we can parse it into usable structures. There’s no way to look for individual schools or police districts, or even types of crimes or any kind of follow-up. As disappointing as this last part is, there’s still a lot of great information here, and for that, we thank Sarah Larimer and Andrew Beaujon. look at the article again. There is a link to a .csv file, so you can sort to your heart’s content.